The Sheridan Terrace Library Media Center is open to all students and staff on Days 4-6. The students meet regularly with Mrs. Lynn, our library media specialist, once every 6 days for 40 minutes (30 minutes for kindergarten & autistic support) to develop an appreciation for various literary genres, become familiar with noted authors and illustrators, research various topics of interest, and access the electronic card catalog to find materials. Mrs. Lynn also collaborates with staff for added enrichment and remediation. 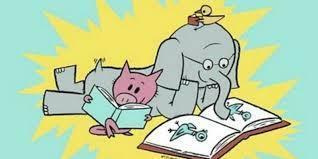 Click on the Elephant and Piggie to find a book in our library!